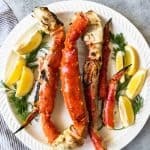 If you have ever wondered how to cook Alaskan King Crab Legs on the grill, this simple approach makes it less scary and a great idea for a special occasion meal, especially when you get to dip the rich, wonderful crab meat in an easy, simple lemon garlic butter sauce! Preheat grill to around 300 to 350 degrees F. Brush the crab legs with olive oil to prevent sticking. Place crab legs on the grill for 4-5 minutes, then flip and cook for another 4-5 minutes on the other side until the meat is hot all the way through. Remove the crab legs from the grill and cut open using kitchen shears. Serve with the melted butter mixed with the garlic and lemon juice for dipping.